We recently caught up with Jason Moss , Co-founder and General Manager at Metis Data Science. We will be chatting about his previous experiences and his work at Metis, We’ll also be exploring the culture and learning environment at Metis and how they prepare their graduates for careers in Data Science. Q : What’s your 1 minute bio / introduction? A : For almost 20 years, I have worked in education. From founding a nonprofit organization in New Orleans to working at global companies such as McKinsey & Company, Scholastic, and now Kaplan, I have sought opportunities to build businesses and work with exceptional teams on creating transformative learning experiences and products. Q : Can you tell us a little bit about your background and role at Metis? engaging with data scientists around the country with whom Metis can collaborate. Q : How did you get into Data Science Education / Training? A : In 2013, I was the head of strategy for Kaplan Test Prep. In that role, I helped them make the decision to enter the “new economy skill training” (NEST) market by launching Metis. Though we didn’t initially focus on data science, we knew there was a great need for improved training and a way to address the supply/demand imbalance. In 2014, I collaborated with the team at Datascope, a data science shop in Chicago, to design our bootcamp, which paved the way for Metis to enter the data science training market in September 2014. Q : What is your definition of a Data Scientist? A : Contrary to the popular notion that a data scientist is a statistician who lives in San Francisco, I believe a data scientist is someone who uses a combination of programming, statistics and domain knowledge to flexibly apply diverse quantitative methods to generate value from data. Thanks for the introduction. Lets talk about how you select your fellows and the different things you look for. Q : What’s the 1 minute bio / introduction on Metis? A : Metis accelerates your career in data science. From full-time, in-person “bootcamps” for the career switcher to part-time courses in specific data science areas for the skill-builder, our portfolio of data science courses offer project-based training using real data and taught by world-class industry practitioners. Q : How did the idea for Metis come about and what do you hope to achieve with it? A : As noted earlier, the idea for Metis came from the strategy work I was doing at Kaplan, which was looking at how to expand beyond their core offerings. “Bootcamps” are in many ways analogous to test prep courses in that they require great teaching, a proven curriculum, and dedicated students. When that mix is right, futures are changed, which is at the core of Kaplan’s mission. Our hope is to build a world-class data science training business. One that is ever-evolving and provides a variety of incredible learning experiences for every customer, from the individual trying to determine “what is data science?” to the industry veteran who wishes to continue to build her skills. It is also our hope that through our focus on data science training, we (our students, alumni, instructors, colleagues) can contribute to the larger dialogue on the power and benefits of data science. Q : How do you screen and select students / fellows for your program? A : Applicants to our bootcamp go through a three-phase application process. First, a student must submit a written application. That application is reviewed and students who pass are then sent a coding challenge, which they have 48 hours to complete. We ask those students also to do a virtual interview (with one our Senior Data Scientists). Those interviews are scored on a six-part rubric by the Senior Data Scientist, inspired by this profile of excellence in data science, as well as our Admissions Manager, to determine if we should admit the student into Metis. Q : Can you describe the typical background (academic/professional) you look for in your students / fellows ? A : We are very intentional not to tie our hands with a too-narrow profile for bootcamp candidates. We’ve welcomed into our program both PhDs and recent college graduates, and software engineers, bankers, lawyers, journalists, and web developers. Hungry candidates with the DNA for success can be found in very diverse places. We believe, and alumni have told us independently, that this diversity of backgrounds creates a very rich and robust practical learning environment. Of course, given the rubric we use to evaluate candidates, and to keep pace with the class and ensure career readiness in 12 weeks, we look for a baseline of aptitude and experience in both programming and statistics or other applied quantitative methodologies. But there are many ways today to demonstrate a sufficient foundation in these areas that we aren’t limited to looking for candidates that fit one particular mold. Q : What type of skills do you look for in a prospective student / fellow? A : We have a six-part rubric that maps to what we look for in an applicant’s interview and challenge material.. The six criteria are: Technical Skills; Coding Challenge; Curiosity; Grit; Passion; and Communication Skills. In terms of technical skills, we need applicants to have worked with code on independent or work-related projects, and the required depth-of-skill varies with the degree of match to the tools used in the bootcamp. That is, someone with a moderate amount of Python background is more ready to hit the ground running than someone with equivalent experience in Ruby, since we use Python quite a bit in the curriculum. In parallel to our 12-week data science skills-building curriculum, we also provide a 12-week careers curriculum. We do everything from resume support, cover letter support and LinkedIn profile positioning to technical interviewing, presentation skills, and salary negotiation. Great, thanks for that overview. Now let’s move to the elephant in the room which is placement, since most individuals seeking to go through a Data Science bootcamp want to use that experience as a launchpad into the industry. Q : How many cohorts have you gone through? 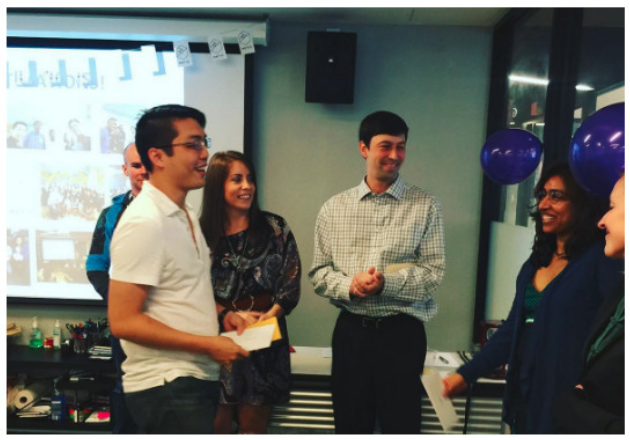 A : We just graduated our fourth cohort on September 18. Our fifth cohort began September 21. Q : What is your typical cohort size? Q : Can you share what your placement numbers look like for your most recent cohort? A : For the cohort (of 21 students) that graduated three weeks ago, two have accepted job offers, four additional students have received job offers, and the remainder are actively interviewing with multiple companies with the support of our Careers team. We are upfront with students that despite the frenzy around data science, getting a job is an intensive and time-consuming process. Q : Can you also share your historical placement rate? 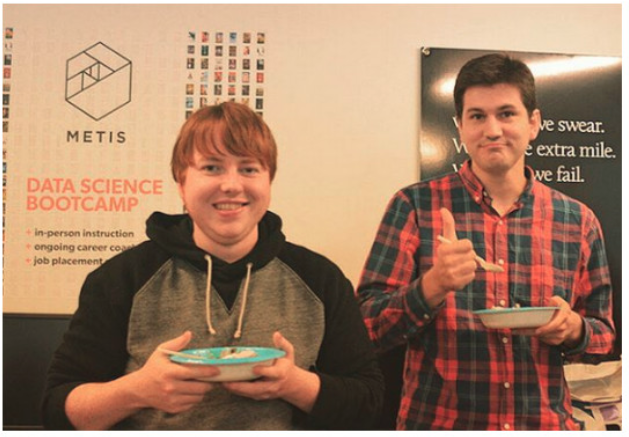 A : 94% of the graduates of our Metis data science bootcamps are employed full-time. The employment rate calculation is ​made on October 23, 2015 and is ​based on ​all ​students who graduated at least six months ago​ from a Metis data science bootcamp​. Omitted from the rate are students Metis has been unable to contact​ ​and students who voluntarily waived employment support​, which in total represents ​11% of our students who graduated at least six months ago. The most common job title is “data scientist​,​”​ however not all employment is as data scientists. Q : Do you have a hiring day and what percent of students are placed from a company they meet at hiring day? A : Every bootcamp culminates with an in-person Career Day, when the students do 3-minute presentations on their passion project to a room full of hiring companies, alumni, future students, and friends of Metis. We typically have 20-25 companies in attendance. Q : What percentage of your fellows eventually get Data Scientist vs Data Analyst vs Other technical jobs? A : About 90% of our students get jobs “highly related” to data science after attending Metis. Job titles vary significantly, and even similar job titles can have very different meanings at different companies. That said, about 15% of our students accepted jobs with “analyst” in their title. Q : Can you share with us where some of your graduates work or will work? Q : Can you share with us what industries your graduates work in? Q : How do you prepare your fellows to be very competitive for Data Science jobs? A : In parallel to our 12-week data science skills-building curriculum, we also provide a 12-week careers curriculum. We do everything from resume support, cover letter support and LinkedIn profile positioning to technical interviewing, presentation skills, and salary negotiation. Ultimately, however, we believe our curricular approach, which couples an emphasis on the design of data science projects with an introduction to a wide array of technologies, tools, and algorithms that they can apply to their portfolio of 5 different data science projects, is what makes them extremely competitive in the data science market. One of the biggest leaps that new data scientists have to make in their first job after learning the technical ropes is to apply the classroom knowledge to real world problems. Q : For organizations looking to hire Data Scientists what should they look for..Ivy Degrees, PhDs, Extensive experience, Quantitative Background, grit and determination? A : They should look for a mix of technical competence, curiosity, grit, passion, and strong communication skills. In some cases, they should also look for domain expertise in that industry, though many firms can tell you that this often not necessary as a “pre”-requisite if there is enthusiasm and some kind of perceptible or demonstrated domain aptitude Too often job postings for data scientists throw every language, package, and skill they have heard of into the “requirements” section. Being too selective up front walls off an immense number of terrific candidates. People interested in data science are perpetually interested in learning more skills, applying them to more domains, and understand that this will be part of the job, forever. A bit of allowance for post-hire skillbuilding, apprenticeships, or “thick onboarding” blows the doors open very wide for intensely talented applicants to come in and become loyal and custom-trained data workers. In terms of psychological discouragement, our instructors and speakers are open with students about the gap between the public perception of data scientists as superhuman unicorns who know everything that computer science and machine learning could ask of them off the top of their head, and the reality, which is that practicing data scientists have some deep experience, broad awareness, and they are not immune to bouts of intense impostor syndrome and intimidation by the expanse of things to learn and do in a data science career. Thanks for walking us through your placement numbers. Now lets talk a bit about how things are run at Metis. We know that the culture and learning environment plays a huge role on how students perceive their bootcamp experience. Q : Can you give a short summary of a typical day in the life / week in the life for your fellows? A : A typical day might kick off with a 30-45 minute pair programming exercise. Then, the students convene for a 60-90 minute class session by one of the Senior Data Scientists on the team. After the presentation, students start working on challenge questions related to the day’s material or on the current project (either individually or in groups). They take a 90-minute lunch break from 12-1:30, and continue that work through the rest of the afternoon. The instructors provide support and/or pair with students throughout this time. Some days there’s a networking event or invited speaker in the evening. For instance, at 5:00, a data scientist from one of Metis’ hiring partners might come to speak to the class, providing a “lightning talk” on a particular facet of data science, as well as an overview of the company and the types of data science roles they are recruiting for, or we might host a local meetup chapter’s event in the common area with refreshments, open to the public. Students hear from 12-15 speakers during the 12 weeks, and by graduation are well on their way to being established in the community of their peers. Q : How do you improve your process and instruction from cohort to cohort at Metis ? A : Our curriculum, pedagogy, and operations are constantly evolving, based on student feedback and staff innovation. The Senior Data Scientists sit down with each student to solicit feedback. I “interview” each student at the end of Week 3 or Week 4 to get feedback, which the team immediately reviews and responds to. We also administer surveys (at the end of week 1, week 12, and 4 months after graduating) which we mine for ideas to improve the program. Q : What skills and tools do you think should be emphasized more in Data Science education? A : Too much emphasis is placed on the hard skills : machine learning, optimization and programming. These are all of course necessary, but a new hire will be lost and disappointed when their hard skills fail to bring them the success and fulfillment they anticipated on the job. An overreliance on classroom examples, and even Kaggle competitions, can inadvertently serve as a crutch, since they potentially do for the student what they ought to be learning to do for themselves — they rob them of the crucial step where the problem space and the available toolkit are brought together to create a procedure that creates something both practical and interesting. Coming back to the ‘why’ and the ‘how’ of a solution during training, and making students learn to take these steps themselves, is what produces flexible and competent team members. Otherwise you run the risk of just producing data technicians who need lots of explicit guidance and oversight. Q : Given the very fast progression in the field, what skills do you think will be most important for Data Scientists in the next few years? A : Above all, the most important skill is staying flexible. Depending on the placement, new data scientists might find themselves in an environment where they’ve developed deep competency on their company’s data stack, and the temptation will be there to rest a bit too long and start to stiffen up. Our instructors warn the students throughout the course of the bootcamp that they should not be looking forward to the day where they are “done” and have attained a breadth of competence and mastery that will serve them until retirement. Data scientists are signing up to stay at the cutting edge at the pace of innovation. If the current job is not pushing them to pick up new skills and tools, they must take the initiative to do that on their own, and to design their own continuing education. Fortunately, data scientists tend to be very social and civic-minded, so meetups and other groups abound where practitioners can get together and continue learning through doing or through teaching others. Q : The Data Science bootcamp space is getting quite crowded, how does Metis differentiate itself? Emphasis on project design. While Metis, of course, provides extensive instruction on various technologies, algorithms, and tools, at our core is an emphasis on project design, starting with the process of asking questions and iterating on hypotheses as new data is uncovered and analyzed. Through each of the five projects in our curriculum, we focus on teaching this iterative design process. Foundation of learning science. Since Kaplan is the parent of Metis, we have been able to integrate best practices around learning science, assessment, and motivation throughout our curriculum. Accreditation. 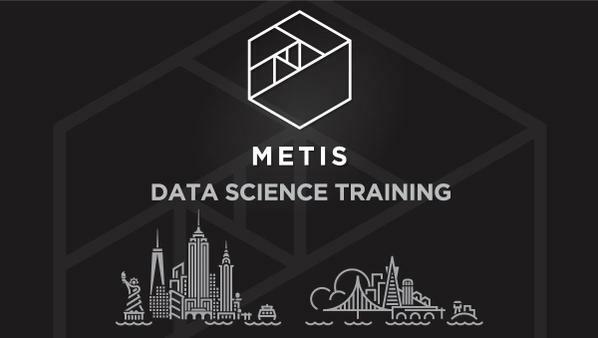 Metis provides the only accredited data science bootcamp. This means we must deliver on helping our graduates get jobs, or we will be closed down. In addition, accreditation carries with it a number of benefits, such as counting for academic credit or being eligible for reimbursement by employers. Accreditation is also a necessary step in Metis ultimately being able to enroll F-1 (international) students and issue temporary I-20 visas. Q : How do you work with your students to ensure they’re assimilating most of the material in a very short period of time? A : If they haven’t internalized the tools, they won’t understand what they’re doing in their project work, and they will hit a brick wall in preparing their project presentations and come to the instructors to figure it out. The project based curriculum actually ends up being a pretty elegant system. When everything the students are doing is leading up to a finished piece of work that they will either stand up and present in front of their instructors and peers or put on the internet for employers to see, the practicality of the material becomes obvious to the students, and any mis-applications or inappropriate assumptions become obvious to the instructors. Of course, it’s not the case that every bit of material will be used in one of the five project. However, if we teach six clustering methods, and the students use one at a deep and practical level to understand something about the tweets and users involved in a particular hashtag, they have banked specific knowledge about that algorithm, as well as transferrable knowledge about how they’d go about using the other clustering techniques, which may have been only used for them in the challenge exercises. They can come back to the code and output they’ve done in the homework, to their notes, and create an analogous experience for themselves with material they used in less depth during the bootcamp, or even with future algorithms they come across later in their work. Q : How do you help students deal with burnout? A : The 12 weeks are intense, but our day ends at 6 and we promote a culture with full nights of sleep and minds fresh for learning. It’s often the case that our instructors are encouraging students to go home and sleep, rather than cheering on the ones who choose to burn the midnight oil. Data science is a profession that doesn’t suffer zombies. A fresh mind is the best way to do good work. In terms of psychological discouragement, our instructors and speakers are open with students about the gap between the public perception of data scientists as superhuman unicorns who know everything that computer science and machine learning could ask of them off the top of their head, and the reality, which is that practicing data scientists have some deep experience, broad awareness, and they are not immune to bouts of intense impostor syndrome and intimidation by the expanse of things to learn and do in a data science career. The students are often deeply encouraged by the openness of our instructors and speakers about this “touchy feely” aspect of the work. But in a sense, it’s essential to know that very successful people have felt and continue to sometimes feel that way. You get discouraged, you get a reality check, and you get up and go back to work. We also inject a lot of fun into the week to break up the pace and to build community. This has included everything from yoga and zumba to discussion groups and bar crawls. Q : Are students ever asked to leave or are kicked out mid-way through the course or at anytime during the course? A : This has not happened yet. Of course if someone were disruptive or dangerous, they would be removed, and if someone did not meet our attendance or satisfactory academic progress requirements, they could be removed. But, we try to do the weeding out in the admissions process, and to follow through with our admitted students from the first day of class through to their first day on the job. Thanks for shedding more light on that. It’s interesting to see that Metis has chosen to become accredited. This opens the door to more financing options and more access especially to individuals who are currently not in the US. Lets wrap up with a few more questions. Q : What do you feel is broken with Data Science education and how is Metis trying to fix it ? A : Too much of data science education is focused on teaching tools and technologies. While necessary, using the tools and technologies without employing a design-based approach to data science is akin to painting-by-numbers. Q : What problems in Data Science keep you up at night? Q : Have you faced any major challenges in running Metis ? Q : What markets / verticals are you currently focused on ? A : We are currently focused on the consumer career changer market (through the bootcamp), the consumer skill-builder market (through our professional development evening courses), and the corporate data science training market. Q : Do you run multiple or concurrent programs ? A : We run consecutive, non-overlapping bootcamps in both New York and San Francisco. There is a slight overlap between the New York and San Francisco bootcamps. Q : How do you feel the New York market differs from the Bay Area market for Data Science opportunities? A : While both markets are huge, there is more opportunity in the Bay Area simply because of the types of companies based there. As a result, data science has become part of the city’s vocabulary. (Where else can you drive on the interstate and see a billboard about machine learning?) On the other hand, there is also probably greater cynicism around data science in the Bay Area. Companies have spent millions on data science in the hopes that it would be a panacea for their businesses. That’s not realistic, which has resulted in a lot of waste. In comparison, New York is still in a slightly earlier stage of its love affair with data science. Q : Who are the Data Scientists that inspire you? A : Nate Silver is the king of results-based application of quantitative (statistical) methods to broad-interest predictive problems. Claudia Perlich, Chief Data Scientist at Dstillery, is deliciously practical in her talks, singing the praises of regression when everyone wants to talk about the day’s hot models like random forest or neural networks, and advising practical caution and common sense when it comes to troublesome data types like geocoding. Ben Wellington, the blogger behind I Quant NY, is constant reminder for me of the power of effective storytelling with data, and the need to open up public data to improve living for everyone. The spirit of data science is that there are plenty of amazing projects available for everyone, and that the technical demands imply that almost none of us could survive and thrive in isolation. The best data science is done by people working together, having a really good time working on very hard problems that would be excruciating without others to rub brain cells together and share the load. Q : Any parting words for prospective Data Science students or Data Scientists that are just starting their careers? A : Do your research. These are not light career choices or financial investments. If you are considering a career in data science, talk to data scientists and find out what they do. Similarly, if you are considering attending a data science bootcamp, talk to people who have gone to data science bootcamps and learn about their experience. Thanks again Jason for taking the time to share some of your experiences with us. We do appreciate it .